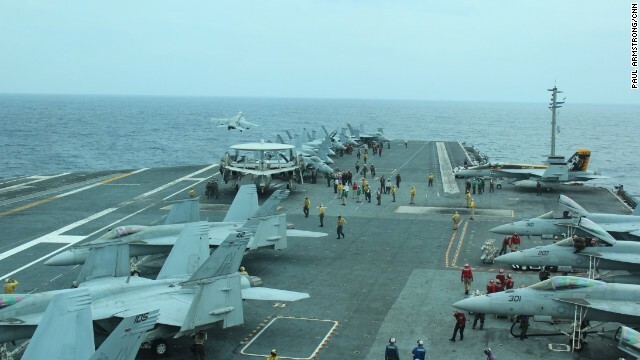 The Pentagon plans to keep an aircraft carrier in the Mediterranean longer than planned as a military presence to reassure NATO allies following Russia’s intervention in Crimea, CNN has learned. The Obama administration is expected to announce the development involving the USS George H. W. Bush on Thursday. But several U.S. officials said the decision was part of a package of new military efforts to beef up the American presence. Although the administration is focusing on diplomacy to resolve the Ukraine crisis, the military part of the equation was discussed in depth at a White House meeting on Tuesday, a military official said. Asked about the decision regarding the USS George H.W. Bush, a senior administration official said don't expect a lot more muscle flexing or additional military steps between now and Sunday's referendum in which Crimeans will be asked whether they want to reunite with Russia or be part of Ukraine. As for Secretary of State John Kerry's trip to London to meet with Russian Foreign Minister Sergey Lavrov, that official said they are seeing more of a willingness to engage in diplomacy on the part of the Russians. But the official cautioned they're not preparing for a huge diplomatic breakthrough. Several officials confirmed that there are intensive discussions across national security agencies about a variety of military options to increase the U.S. presence in the region. All of the officials, who are directly familiar with the discussions, say the issue of moving military assets presents a fundamental problem. “We have to be seen as doing something, but are ships really going to change Putin’s mind?” a second official said. For now, the U.S. assesses that Putin will continue to send small numbers of additional troops into Crimea, and is not looking to escalate the situation militarily. The United States believes Russia has established a strong line of command and control into Crimea and “has set very tight rules of engagement” to keep the situation under control, the second official said. We're not going anywhere NATO is not going anywhere this was a good move . The problem is Russia's not going anywhere. Russia invaded Georgia, and we did nothing. Russia's now annexed Crimea, and we've done nothing. At what point does Putin, emboldened by American inaction, actually go too far and push us into war? Obama must be a student of Neville Chamberlain. Please Scott, lose the ignorance! First of all, The Georgians attacked South Ossetia killing some 10 to 12 Russians along with several South Ossetians amd Russia simply retaliated. Don't forget that we invaded both Afghanistan and Iraq and conquered these countries and we never gave rither the Afghans nor the Iraqis a plebiscite on whether they want us there or not whereas the Russians did give the Crimean people that choice. Quit parroting that stupid White House manure, will you? Sorry Jeff, you just need to ignore all these ignorant people like Scott above and move on. Evidently, this Scott never attended high school and there unable to think for himself! People will continue to say the most ignorant things here! Welllll...Russia invaded Georgia during BUSH'S term, not Obama's.....Sheesh, Obama gets blamed for everything!!! Ukraine did not have T.V. station managers durring the Nazi invastion. Watch the Ukrainian MP's rough up a TV station manager and force him to write a letter of resignation. The irony is the leader sits on the new Ukrainian freedom of speech committee. Plays into Putin's idea that the government is a bunch of neo Nazis. Google it. Well said, Tupper. Thank you. 26. I know you are but what am I: protaganist. 24. Putin the gas station attendent where once you pay and pump your own gas Putin holds a gun to your head and your money while you siffen your gas you just pumped from your tank back into Putins pesonal stash expected to then thank Putin for helping you remain out of Gas after Putin runs the customer off with no money no gas and nowhere left too turn. 20. a self apppointed imaginary Global launguage authority with a suicide by Cop underwriter. 16. A double standard Russian foreign policy maker. 12. Worlds largest Country now give-me-another-warm-weather port or I will have your family killed just before I kill someone else and their nahbiors in Syria first. "The more the west pushes at some point there is going to be an extreme adverse reaction.". Putin just "stole" a gas refinery in Ukraine and is now promissing to invade the "West". Looks like intelligent is out the window. Hey you, Kdfguk Dfgik, can you refrain from using that filthy Tea Party lingo on this website? It has absolutely no place here. We're trying to hold an intelligent discussion over Ukraine and this is no Tea Party Convention! Someone should hand Putin a roll of TP. The Russian Army in Crimea-a- river-Putin...have "tiny-Minds". All this stupid warmongering gets old. These ignorant fools have no notion as to what war is like. They falsely perceive the glory that doesn't exist except in their tiny minds! Well said, Salty Marine. Unfortunately, most people here in America perceive these obnoxious wars to be sporting events just like hockey and baseball. This fallacy needs to be eliminated! Pulling out and dusting off the could-be manual for preparing human flesh for human consumption comes to mind... sadly. Notice how the Russian insurgents in Ukraine are dressed like terrorists in ski masks. Hitler did kill his own people e.g. the Germans that lived in the Jewish Getto in Germany AKA Jews who were also Germans. Not to worry the Super Carrier Bush can take on the entire Russian military from the Mediterranean and win! The USS Bush would turn the entire Russian Black sea Fleet in to sunk junk in a matter of hours! There is no need to move the Carrier to the Black Sea and put it in harms way! Plus if the Russians dare to take on the US they will face the full might of the entire NATO Group and they know they can not win that war! Obama has 2 Trump cards NATO & Turkey but he has a limp wrist and may find it just to hard to use it! Word in the Media right now is Putin is a Man and Obama is just a Wimp? Your kind of bravado is truly disgusting, FLOYD. Don't forget the Germany and J apan also had superior weapons in 1941 when both the U.S. and Russia entered WW2 but lost all the same. Did you ever hear the adage that the side that wins the first battle rarely wins the war? Believe it or not, it's quite true. Are you a member of the Tea Party Movement? You sound like one! Sorry for the misprint above. I meant to print "that Germany and J apan.........", not "the Germany and J apan.........". Jack, you shouldn't have wasted you time by answering to that stupid crazy fool above. That bozo who made that ignorant comment most likely never got past the 4th grade. In other words, you can't cure ignorance! Putin is vertically challenged and probably wears lifts in his shoes. Obama can eat soup off Putin's head. Russian military technology is almost non-existent. AWACS aircraft are flying over western Europe and monitoring all military movements. Polish jet pilots in their F-16s and Ukrainian pilots in their Sukhoys are practicing air operations. The Polish army has re-designed Russian-made tanks and made them better. Russian-made tanks encountered in Iraq and Afghanistan were penetrated and exploded without much effort. Actually, if we were to attack Russia, we would be the aggessor, and the other NATO countries would be required to come to the defence of Russia. Of course, Russia would release a few nukes while waiting for our NATO allies to protect them and attack the US. Basically, it would be ludicrous to expect the other members of NATO to attack the US when we are the aggressor, which just goes to show how worthless the whole alliance thing really is. In fact, NATO is really an extension of the US military that we fund to do our bidding and then claim that it is not necessary for concress to declair war because NATO is not the US military, even though it basically is because it is bought and paid for by us. Thank you, tony. How true that is! Hitler killed the way the Nazi did because a bullet was pricy and a eighty pound corpse is far easyer to bury & or burn...a manufacturing packaging solution where god kills the damned instead of the judging jailers mind. Stalin killed millions of citizens because there were just too many god-damn mouths too feed. Both Hitler and Stalin killed millions of human beings but fundamental difference between the two satraps is that Stalin killed his own fellow citizens. And now Russia is ready to attack its brothers from Ukraine...Sad – the history repeat itself again and again. Stalin killed millions because he was paranoid and delusional, just like Putin, and was always afraid of being overthrown. When Hitler invaded Russia, Stalin hid himself for days because he was afraid that the Russian people would come for him and hang him. Hitler like Putin used GAS too "great" effect in europe albiet, Hitler was a real leader unlike Putin who is the worlds richest man-child criminal. Putin has never actualy been part of a single legit democratic vote any where @ anytime...false vote yes...but we all know only children write votes that only allow for one answer to a question that was never asked by anyone anywhere @ any-time. Bring the TRUMAN HOME! We are waiting for our sailors. BRING THE TRUMAN HOME...ITS TIME FOR SOME ONE ELSE TO TAKE THE WATCH. I WANT MY SAILOR HOME. ITS BEEN ALMOST A YEAR. WHY DONT YOU PEOPLE REPORT ON HOW IT EFFECTS THE TRUMANS DEPLOYMENT...WE WANT ANSWERS. BRING THE TRUMAN STRIKE GROUP HOME. Hey, get over it. All this B.S. "bring the troops home" is nothing more than defeatism and cowardice. And it invites further aggression. These service members are professionals and they volunteered. So, stop whining at least so long as you're likely enjoying the economic benefits of their service. Our more evolved descendents will realize that we humans of the 21st century are presently entering an especially dangerous period in our evolution. Our gradually growing intellect does allow us to develop the technology needed for our desired comfort and prosperity. Yet, they will also know that since our Second World War, leaders of nations and movements have also chosen to try to use the imposing technology to produce and sell and buy invisible bombers and smart missiles and quiet subs and fast tanks and many, many more weapons of our mass, self-destruction. History will show how our leaders competed for expanding political influences and territories and economic power by using, or threatening to use, their modernizing military strength and better weapons. So what are we reassuring our Nato Allies of - that we are still commited to waging war to control the global oil supply? We certainly are not there to protect the Ukrainian people - or we would be saving them from the militants that seized control of their country by force and now call themselves the government. We certainly are not protecting the Ukrainian people as this extreme muslim group will no doubt follow suit and try to install sharia law (think Egypt, Libya, and Ivory coast as examples – just off the cuff). And we certainly are not protecting the American people as letting an extreme islamic group gain control of a government will no doubt increase the flow of arms to terrorists, persecution of americans by islamic extremists, and global unrest due to pressure of the islamic extremists. Fortunately, for now, the Ukranian military has not surrendered to the new Ukranian 'government' just like the French military did not surrender to Hitler when the French government officials 'surrendered' resulting in Hitler having to go around the French military for the duration of the war – not allowing him direct passage. WHAT????? I think you are confusing Ukraine and Syria!!!! .....or, maybe you are just confused!!! DENOUNCE THESE CRIMINAL THEFT, MURDER, DRUG, VIOLATIONS OF WOMEN 300,000 CASES OF VIOLATIONS UNDER TORTURE AND USE CONSTRAINTS PROGRAMMING. SEND A COMPLAINT INVESTIGATION CRIMINAL ORGANIZATIONS PUBLIC WAITING FOR THESE EXPLANATIONS televised CRIMES, THE DIRECTORS OF THE FBI, INTERPOL and EUROPOL. COMPLAINT A PUPPET Pupet – ICO ROKEFELA. DENUNCIAMOS A LOS SIGUIENTES CRIMINALES POR ROBO, ASESINATO, NARCOTRAFICO, VIOLACIONES DE MUJERES 300.000, CASOS DE VIOLACIONES BAJO TORTURA COACCION Y USO DE PROGRAMACION. ENVIAMOS LA DENUNCIA A ORGANIZACIONES DE INVESTIGACION CRIMINAL ESPERANDO EXPLICACIONES PUBLICAS TELEVISADAS POR ESTOS CRIMENES, A LOS DIRECTORES DEL FBI, INTERPOL Y EUROPOL. DENUNCIA A LA MARIONETA PUPET – ICO ROKEFELA. Not good news. My son is on the HST waiting to come home. God bless those who serve. What we need to do, Navy Mom, is to quit this nonsense over Ukraine. We have absolutely no national interests there and what's going on there is none of our business! I hate to think of all the servicemen and women who died in all of these useless wars that we got dragged into over the last 13 years. This needs to end! What a revolting scene this is! Along with murder and bribery, military threats have a staple in U.S. foreign policy. This here proves just what gigantic bullies we have become on the world scene. As Americans, we should hang our heads in shame! STFU if you don't like it leave. Glenn, you are an utter IMBECILE! The folks in NATO may be reassured. The people in the Ukraine not so much if they look at Syria, Libya, Iraq, Afghanistan and Egypt. to hell with diplomacy nuke the entire western world one big light in the sky of electro magnetic radiation and usa britain and israel will boil away in a sea of flames. one blow to the head and usa is finished all this talk is pointless usa is trying to gain economical from ukraina directly or indirectly usa military power against all western countrys usa puts a aircraft carrier there china and russia need to put 2 aircraft carriers there let there children suffer. I would like to thank all our heroes, the one who have to do all the dirty work, for showing support for our allies. Of all the places we stick our nose in around the world, this is one of those places where any help we lend isn't only asked for, but highly appreciated. You don't see a whole lot of that in the middle east. Hopefully this will all resolve itself quickly and they can come home to their families safe and sound. I have mixed feelings about the Ukraine but your right this is not the Middle East. I don`t think it will be resolved quickly but I think it will be peacefully. Sorry folks, I never posted that stupid comment above. It looks like somebody's trying to make me look like a complete moron! great now I guess my wife will stay in the middle east as the bush was relieving her carrier. FROM A SAILOR WHO IS SITTING ON USS HARRY S. TRUMAN....WE ARE READY TO GO HOME!!!! FROM A US MARINE WHO IS SITTING ON USS HARRY S. TRUMAN....WE ARE READY TO ANSWER OUR NATIONS CALL TO PRESERVE FREEDOM!!!! From a Sailor aboard Harry S Truman. We've been answering for months. Are you now just ready? You're an aviation Marine, really? Sprout a set of b*lls and do your job. Stop whining. After the United States Revolutionary War ended in 1783, brave and patriotic citizens continued to serve in the military and bravely sacrificed their lives in 19 more wars. 19 more wars, all of which occurred in foreign countries with the exception of the War of 1812, and the Civil War and American Indian Wars when we turned our guns upon our own people. In the U.S., almost since birth we sing most loudly, always in unison and cheer as fighter jets perform low flybys. In the U.S., we have people like you and me, that can express themselves in this and any forum, without fear or retribution from the government. Try doing the same in Russia, China, Cuba, Venezuela, North Korea and Vietnam. Get the picture?